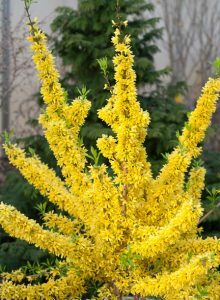 Forsythias are certainly welcome sights in the late winter because these early-blooming shrubs splash the dreary, cold landscape with showers of bright yellow stars and signal the fact that, yes, there soon will be another spring. That’s why it is too bad many homeowners abuse and mistreat this beautiful bush. No malice is usually involved; there is just a lot of well-intended but misguided “care” being given to these shrubs. First of all, forsythias need little attention anyway. Just a sunny location, an occasional shot of fertilizer early in the spring and a maintenance pruning every two or three years is about all that is necessary, thank you. However, it is in the pruning that a lot of people mess up by trying to sculpture forsythias. These shrubs aren’t boxwoods, so they shouldn’t be shaped into pyramids, globes, ‘57 Chevys or larger-than-life renditions of family pets. Forsythia displays are much more spectacular when they are allowed to freely flow outward and form their characteristic cascading shapes. If restrained plants are the goal, compact varieties are the answer. ‘Gold Tide’ is a dwarf forsythia that has a 4-foot spread but only tops out at about 2 feet. ‘Fiesta’ is another shorty, refusing to exceed 3 feet in height. This cultivar has the additional bonus in the beauty department of lime-green foliage that is lit up with yellow veins. Also consider another 3-footer, ‘Arnold’s Dwarf’, and the diminutive ‘Bronxensis’, which tops out a just over a foot tall and has a spread of less than 4 feet. If local nurseries don’t have any of these shorties, a quick search online will find them for sale. For regular-sized forsythias such as the popular ‘Spring Glory’, periodic pruning is necessary to keep the rapid growth in check. When these shrubs need to be pruned, the timing of the cutting is important to maintain the plants’ full flower power from year to year. Usually, pruning should be done as soon as the flowers fade. Old branches and early foliage poking beyond their allowed bounds are the only casualties of this timely cutting because next year’s flower buds will develop on the new wood from the current season’s growth. There is another school of thought that suggests pruning forsythias in late winter before they bloom. The reasoning behind this is that, with bare branches, it is easier to see inside the bushes where to make proper cuts. This early pruning results in, of course, fewer flowers the first spring. The choice is yours. As far as the actual dastardly deed itself, leave the electric hedge trimmer in the garage and use proper tools for pruning forsythias. Hand clippers and loppers are ideal for the job. To prune this arching shrub correctly, cut the longest intruding stems off at intersecting joints on branches tucked inside the bush. 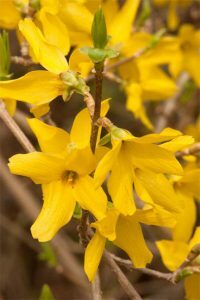 If an established forsythia is really getting pushy in the garden, it can actually be cut back to within a foot of the ground. This will certainly keep it in check for a few years, but such a harsh pruning has its price. Since so many branches are cut off, don’t count on a bevy of blooms any time soon. 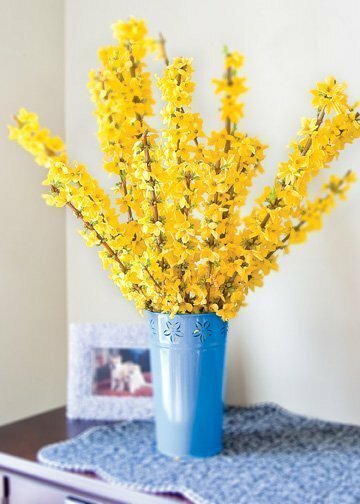 Forsythias can spread by tip rootings, and you can easily give these beauties a helping hand. How easy? This spring, just bend a few branches into individual one-gallon pots of dirt sunk into the earth. Then, leaving 8 inches of tip growth sticking up, secure each branch with a heavy rock or a hook cut from a coat hanger and pushed into the pot’s soil. By the fall, roots will have formed on the grounded branch, so snip the limb coming from the mother plant close to the soil line in the pot, and you will have a new plant. In the late fall or early winter, you can plant these new forsythias in another location or concentrate them in the same area as the original plants, forming a botanical barrier for your landscape. I built a “fence” on the side of my yard in four years using the forsythia’s ability to root ‘n’ roll. As spring warms into summer, the flowerless forsythias will slumber in a visual green dream. This solid mass of foliage can be utilized as living background to show off such brightly blooming plants as dahlias, roses, zinnias, turtleheads, purple coneflowers, salvias and daylilies. If you can’t wait for the spring flowering season to begin, you can force bloom a few forsythia sprigs indoors. On a day when it is above freezing, snip several 2 to 3-foot sections of branches and bring them inside. Place these in water quickly to keep air out of the hollow branches, which can slow water absorption. With a knife or hand pruners, split the ends of each branch an inch or two from the bottom then put the sprigs into a decorative vase of warm water. Remove any flowers buds or branches that are under water. Change the water every few days and keep the vase in a warm, bright room, but not direct sunlight. Depending on how they would have naturally bloomed outside, the sprigs should start blooming indoors in as early as a week or two to over a month. If it takes more than one week to bloom, cut an inch off the bottom of the branch each week until it flowers.